Follow the emergency treatment guidelines. Irrigate under the tissue flap with a warm saline solution (figure 6-5). 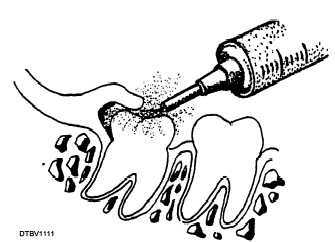 Gently clean the area with a sonic scaler or hand scaler. Instruct the patient to rinse with a warm saline solution every 2 hours. Contact dental officer if patient is febrile or if lymph nodes are palpable. The dental officer will determine the need to prescribe antibiotics. Figure 6-5. - Irrigating beneath a tissue flap. This section describes emergency conditions resulting from inflammation of the oral mucosa, postexodontic complications, and trauma to the teeth and their supporting structures. "Stomatitis" is a general term used to denote inflammation of the oral mucosa. Two types of stomatitis are common in dentistry, they are herpetic gingivostomatitis and aphthous stomatitis. Herpetic gingivostomatitis usually occurs on the masticatory or keratinized tissues, while aphthous stomatitis usually occurs on the lining or nonkeratinized tissue. Both conditions are marked by the formation of small blisters and ulcers on the oral mucosa. Recurrent labial herpes is caused by a virus that produces the so-called fever blister or cold sore. They are usually found on the lip and can easily be transmitted to others through casual contact. Perform the emergency treatment guidelines and follow instructions given by the dentist. Instruct the patient NOT to smoke, eat acidic or hot foods, or drink alcohol or use products that contain alcohol such as mouthrises that will dry out the mouth.